The Al Qaeda legend and the threat of the “Outside Enemy” is sustained through extensive media and government propaganda. In the post 9/11 era, the terrorist threat from Al Qaeda constitutes the building block of US-NATO military doctrine. It justifies –under a humanitarian mandate– the conduct of “counter-terrorism operations” Worldwide. Known and documented, Al Qaeda affiliated entities have been used by US-NATO in numerous conflicts as “intelligence assets” since the heyday of the Soviet-Afghan war. In Syria, the Al Nusrah and ISIS rebels are the foot-soldiers of the Western military alliance, which in turn oversees and controls the recruitment and training of paramilitary forces. While the US State Department is accusing several countries of “harboring terrorists”, America is the Number One “State Sponsor of Terrorism”: The Islamic State of Iraq and al-Sham (ISIS) –which operates in both Syria and Iraq– is covertly supported and financed by the US and its allies including Turkey, Saudi Arabia and Qatar. Moreover, the Islamic State of Iraq and al-Sham’s Sunni caliphate project coincides with a longstanding US agenda to carve up both Iraq and Syria into separate territories: A Sunni Islamist Caliphate, an Arab Shia Republic, a Republic of Kurdistan, among others. The US-led Global War on Terrorism (GWOT) constitutes the cornerstone of US military doctrine. “Going after Islamic terrorists” is part and parcel of non-conventional warfare. The underlying objective is to justify the conduct of counter-terrorism operations Worldwide, which enables the US and its allies to intervene in the affairs of sovereign countries. Many progressive writers, including alternative media, while focusing on recent developments in Iraq, fail to understand the logic behind the “Global War on Terrorism.” The Islamic State of Iraq and Al Cham (ISIS) is often considered as an “independent entity” rather than an instrument of the Western military alliance. Moreover, many committed anti-war activists –who oppose the tenets of the US-NATO military agenda– will nonetheless endorse Washington’s counter-terrorism agenda directed against Al Qaeda:. The Worldwide terrorist threat is considered to be “real”: “We are against the war, but we support the Global War on Terrorism”. In a bitter irony, the caliphate project as an instrument of propaganda has been on the drawing board of US intelligence for more than ten years. In December 2004, under the Bush Administration, the National Intelligence Council (NIC) predicted that in the year 2020 a New Caliphate extending from the Western Mediterranean to Central Asia and South East Asia would emerge, threatening Western democracy and Western values. The NIC 2004 report borders on ridicule; it is devoid of intelligence, let alone historical and geopolitical analysis. Its fake narrative pertaining to the caliphate, nonetheless, bears a canny resemblance to the June 29, 2014 highly publicized PR announcement of the creation of the Caliphate by ISIS leader Abu Bakr al-Baghdadi. The NIC report presents a so-called “fictional scenario of a letter from a fictional grandson of Bin Ladin to a family relative in 2020.” It is on this basis that it makes predictions for the year 2020. Based on an invented bin Laden grandson letter narrative rather than on intelligence and empirical analysis, the US intelligence community concludes that the caliphate constitutes a real danger for the Western World and Western civilization. “The fictional scenario portrayed below provides an example of how a global movement fueled by radical religious identity could emerge. Under this scenario, a new Caliphate is proclaimed and manages to advance a powerful counter ideology that has widespread appeal. It is depicted in the form of a hypothetical letter from a fictional grandson of Bin Ladin to a family relative in 2020. He recounts the struggles of the Caliph in trying to wrest control from traditional regimes and the conflict and confusion which ensue both within the Muslim world and outside between Muslims and the United States, Europe, Russia and China. While the Caliph’s success in mobilizing support varies, places far outside the Muslim core in the Middle East—in Africa and Asia—are convulsed as a result of his appeals. This “authoritative” NIC “Mapping the Global Future” report was not only presented to the White House, the Congress and the Pentagon, it was also dispatched to America’s allies. 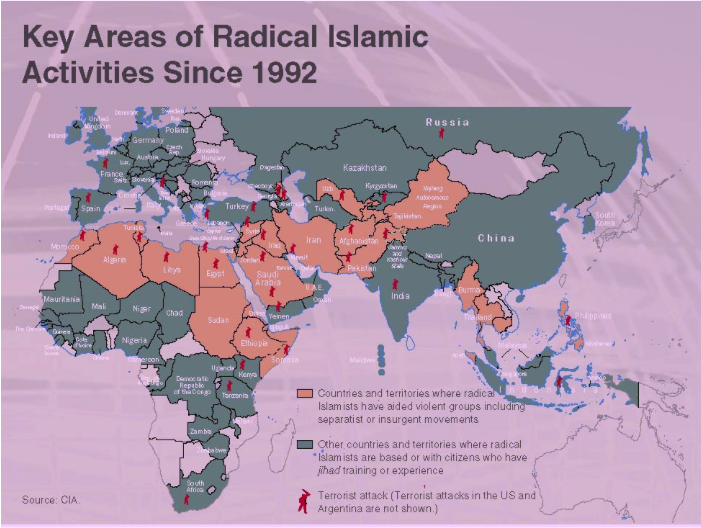 The “threat emanating from the Muslim World” referred to in the NIC report (including the section on the caliphate project) is firmly entrenched in US-NATO military doctrine. The NIC document was intended to be read by top officials. Broadly speaking it was part of the “Top official” (TOPOFF) propaganda campaign which targets senior foreign policy and military decision-makers, not to mention scholars, researchers and NGO “activists”. The objective is to ensure that “top officials” continue to believe that Islamic terrorists are threatening the security of the Western World. 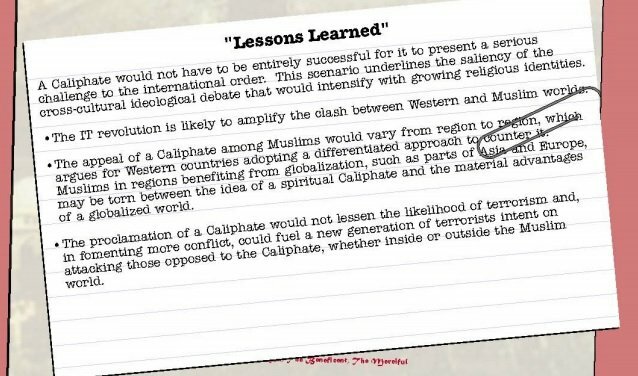 The underpinnings of the caliphate scenario is the “Clash of Civilizations”, which provides a justification in the eyes of public opinion for America to intervene Worldwide as part of a global counter- terrorism agenda. The stated aim of the NIC report was “to prepare the next Bush administration for challenges that lie ahead by projecting current trends that may pose a threat to US interests”. the caliphate project “constitutes a serious challenge to the international order”. What the NIC report fails to mention is that US intelligence in liaison with Britain’s MI6 and Israel’s Mossad are covertly involved in supporting both the terrorists and the caliphate project. In turn, the media has embarked on a new wave of lies and fabrications, focusing on “a new terrorist threat” emanating not only from the Muslim World, but from “home grown Islamist terrorists” in Europe and North America.